The American Fancy Rat and Mouse Association (AFRMA) was founded in 1983 and is a non-profit international club. Anyone that has an interest in rats or mice can be a member. The main purpose of AFRMA is to promote and encourage the breeding and exhibition of fancy rats and mice. We also educate the public on their positive qualities as companion animals and provide information on their proper care. Competition shows are held several times a year in Southern California. These shows are very similar to cat, rabbit, or dog shows. Judges evaluate the animals based on official standards for each type of rat or mouse. We also have Pet Shows in conjunction with our regular shows that are dedicated to pets only with fun classes for rats and mice regardless of their physical qualities. The club has information booths set up at several events around Southern California during each year, including the America’s Family Pet Expo in Costa Mesa, to educate the public on rats and mice as pets and show animals. AFRMA as a club does not hold any views on, nor promote the matters of culling, reptile keeping/feeding, or animal rights. We leave these decisions up to each individual person. We have always been open to the different views the membership has and hope we can all learn from these different ideas. Any ideas or view expressed in AFRMA Rat & Mouse Tales are of the individual contributor and do not reflect any policy of the organization. As a member you receive AFRMA’s magazine-style newsletter Rat & Mouse Tales. It contains articles, stories, questions, medical information, genetics info., ads, show results, photos, etc. Membership also includes the Bylaws, Show Regulations & Standards Book, Directory, membership card, and other informative materials. We have pamphlets on pet care, showing, medical, etc., available online to those interested. A printable membership application form is available to mail in or use our PayPal option. Come visit, join in, and “Like” us! AFRMA in newspapers, magazines, radio, TV, web sites, YouTube, etc. 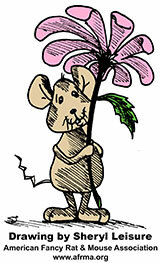 Celebrate Fancy Rats and Mice, the Rat and Mouse Fancier, and the Rat and Mouse Fancy!